A current limiting resistor is a resistor that is used to reduce the current in a circuit. A simple example is a resistor in series with an LED. You would usually want to have a current limiting resistor in series with your LED so that you can control the amount of current through the LED. If too much current is going through your LED, it will burn out too fast. If too little current is going through it, it might not be enough to lit the LED. Check the datasheet of your component to find voltage drop and the appropriate current for your LED. If you can’t find a datasheet, you can test it. Connect the LED and a resistor in series to a variable voltage source. Start at 0 volts and increase the voltage gradually until the LED lit up. Measure the voltage over the LED and the current going through. 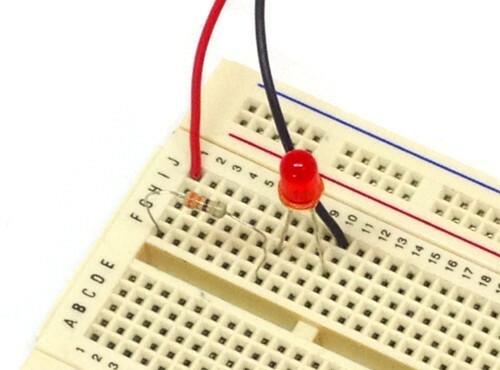 Let’s say the LED needs 15 mA and has a voltage drop of 2 volts. You have a 5 V power source that you would like to power it with. Which resistor value do you need? To find the resistor value, we start with finding the voltage drop over the resistor. Since there is a 2 volt drop over the LED, there will be a 3V drop over the resistor. Ok, so we have 3V and we want to have 15 mA going through the resistor and the LED. To find the necessary resistor value we use Ohm’s law. So the necessary value for the current limiting resistor is 200 Ohms. So you know that you need a 200 Ohm resistor. But when you look for components you find that there are several different types of resistors. Well, the only thing you need to be aware of is the wattage rating of the component. How much effect can the resistor handle? So you need to figure out how much effect that will be dissipated in your resistor. This means your resistor must be able to handle at least 45 mW. Usually, most resistors handle from 250 mW and up, so it will be easy to find a suitable resistor. This is great! Gives the detail we need in easy speak! Thanks! Thanks. Simple and great tutorial for a beginner. Thanks for the explanation. You kept the explanation nice and simple which is good for the beginners. Wow simple with a great value…….hats off…. Very Nice! I’m really impressed with these topics!! very nice answer sir awesome which is really needy for learners. Sir, now in above you explained the conditions of requirement of resistor in circuit, i am very interested to know what are the conditions that makes to use capacitor & inductor in circuit & how to calculate the exact value of capacitor & inductor. please explain me the importance of EMI & EMC in the circuit. Please explain sir, waiting for your valuable reply. Please explain me what is the meaning of Equivalent Series Resistance(ESR) & Its importance in the circuit. If you use a higher value resistor, you get less current through your LED and your LED will be less bright. It would be nice if Your teaching wouldn’t assume that we dommies new what these formulas were about , As You teach add notations to Your formulas !, to explain them , I no it takes up more space ! Pictures fill in the Q????? What if a have 12v input and needs to light up a 10v led.what resistor will i need and the type of transisitor to be use? Hoping you could help me.tnx..
Resistor are not polarity sensitive but LEDs are it will burn out the LED. Very easy to understand,thank you. Nice sir give us information ike this????????????????☺????????☝???? Great explanation and very easy to understand as a beginner like me. Im having a circuit for 12 volt and 240 mA. Power source: 12 volt 5 amps transformer. What value of resistance should i place?